AFC Oakley M&DH closed the gap on Bedfordshire League leaders Flitwick Town to six points with a 5-0 win at Cranfield United on Saturday. They extended their unbeaten run to eight games although the hosts were always struggling after their keeper Tom Anstee was red carded. Jack Weeden with a hat-trick plus strikes from Michael Cox and Nathan Aulsberry brought up the visitors’ nap hand. Flitwick were without a game. 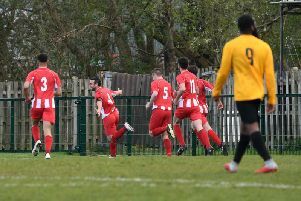 Renhold United, in third place in the Premier Division supported by Sportsform, required a 92nd minute goal from Travis Joseph to win 1-0 at bottom of the table Sandy. Whilst now up into fourth are Wilstead who won 2-1 at Ickwell & Old Warden. Shaun Winconek and Robert Booth netted the vital goals against a lone reply from Andrew Vallom. For fifth place Caldecote their unbeaten run was extended to eight games after they won 4-0 at Kempston Rovers Development, Jack Boyd netting twice and joined on the scoresheet by Jordan Platt and Oscar Smith. Stevington saw their six game unbeaten run come to a end when beaten 3-0 at home by Shefford Town & Campton, Louis Taylor netting twice and Josh Lummis once. Sharnbrook are now without a win from their last eight starts after losing 2-1 at home to second from bottom of the table Ampthill Town Reserves to end the Town’s run of seven consecutive away defeats. Jack Webster and Elis Ralevil were the Town’s marksmen against a lone home reply from Jim Burnside. Now into the semi-final hat are Marston Shelton Rovers who won 2-1 at AFC Kempston Town & Bedford College. Jim Burraway and Wes Burrows were on the Rovers scoresheet against one in reply from Mike Stephenson. The lone action of the afternoon saw Totternhoe Reserves take their unbeaten run to nine games and climb up the league table into second by winning 2-0 at Crawley Green Reserves. Johnny Clarke and Harry Marlow netted the all important goals. The shock of the afternoon saw Old Bradwell United Reserves net a 3-2 penalty shoot-out win over Queens Park Crescents after 90 minutes play had seen the sides deadlocked at 1-1, Billy Batten netting for United and Shahinur Rahman for the Crescents. Also into the quarter-finals are Cople & Bedford SA after M&DH Clapham Sports failed to raise a side to meet them at Grange Road. Shefford Town & Campton Reserves safely made their way into the semi-final draw by winning 5-1 at Elstow Abbey. Malcolm Marimirofa with a brace plus Scott Frusciante, Adam Larsen and Jordan Greenwood all scored in the opening half before Harry Ellis replied for the Abbey after the break. Joining them in the last four are Henlow who won 2-1 at AFC Kempston Town & Bedford College Reserves. Paul Wright and Mark McMillan were on their scoresheet against a Town reply via Keegan Roberts. Wixams’ lead at the head of Division Two is now up to three points despite them being held to a 0-0 draw at Lea Sports PSG. With second place Cranfield United Reserves sitting the afternoon out third place Riseley Sports failed to climb above them when held to a 2-2 home draw by Flitwick Town Reserves. Sam Harrison and Mitch Crook were on the home scoresheet against Town replies via Dan Parker and David Keefe. For Caldecote Reserves it was an end to their six game losing run on the road when they shared the spoils in a 3-3 draw at Houghton Athletic. Jordan Thomas with a brace and Glen Collins were on the home scoresheet against Caldecote replies from Tom Wallace twice and Adam Legate once. Marston Shelton Rovers Reserves remain on top of the Division Three after they shared the spoils in a 1-1 draw at second place Renhold United Reserves. Thomas O’Neill was on the United scoresheet and Dale Malciw replying for the Rovers. Sandy Albion find themselves on a four game winning home run after beating Kempston Athletic 5-2. Liam Brophy and Jonnie Stratford both netted twice and James Smart once to bring up the Albion nap hand against Athletic replies from Gary Whitbread and Daniel Taylor. Also winning 5-2, at Shefford Town & Campton A, were Caldecote A. Mike Astle and Lewis Littlechild were on the home scoresheet against Caldecote replies from Tony Norman with a hat-trick plus James Fuller and Neil Giles. The lone action of the afternoon saw third place Henlow Reserves close the gap on the leading pair when winning 5-2 at Flitwick Town A. Matthew Rumbellow with a hat-trick joined on the scoresheet by Jonathan Rowe and James Davies to bring up the nap hand. Harlington are into the hat for the semi-final draw after securing a 2-1 home victory over CS Rovers. Lucas Robinson and Ben Whalley were on their scoresheet against a lone reply from Jamie Gray. Whilst joining them are Sundon Park Rovers who won 3-2 at Atletico Europa, Chris Scott, Brett Smith and Joseph Bopoola the Rovers marksmen against home replies via Mo Banda and Tafara Nyaruwanga. Into the hat for the semi-final draw are Bedfordshire Saturday Youth league side Delapre Dragons following their 5-1 home victory over Lidlington United Sports. Obaro Shedrack with a hat-trick was joined on the scoresheet by Owen Coles and Connor Fitzpatrick against a lone reply from Rob Foote. Joining them in the draw will be AFC Oakley Sports M&DH Reserves after they won 3-1 at Wootton Village. Justin Muircroft with a brace plus a strike from James Grandidge did the damage against a lone Village reply from Adam Flynn.